‘Kemzy’ drops new single tilted ‘Jail Breaker’. Ukaibe Mathew Ekene is a Native of Igbo from Abia State, Nigeria. Mathew however chose the name Kemzy as a stage name. According to him, friends call me Kemzy alot so I figured it will make a great stage name hence the choice KEMZY. Kemzy is a Computer Engineer who believes that Music is his thing and so He puts His Energy to write and make Music. The Piece ‘Jail Breaker’ is a song that was birthed out of a strong desire to stand tall amidst trials and tribulations. 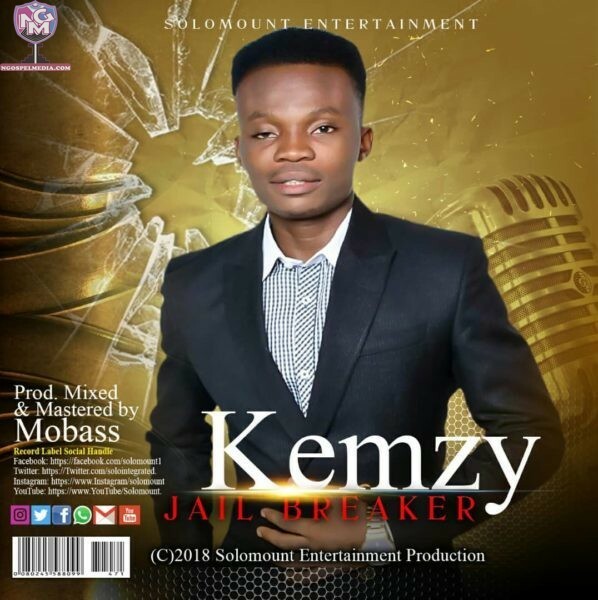 According to Kemzy, Jail Breaker is a song inspired by God to reach out to the broken hearted who are giving up already on life and feel they’ve been locked up in a particular situation for too long. With this Peice, KEMZY assures his fans and friends that God is the way maker and the Jail Breaker, He believes that the song is a piece that will motivate anyone in respective of religion. The song was Produced, Mixed and Mastered by Mobass. Kemzy is Currently signed to Solomount Entertainment a fast rising Record Label.